Microsoft just announced their Cloud Computing platform, named Microsoft Azure at PDC. 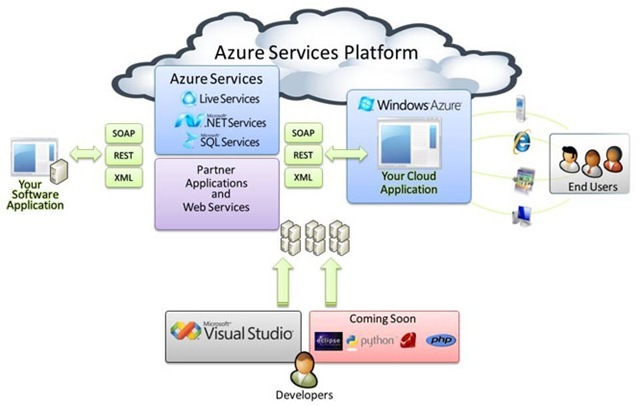 Haven’t looked much into the details yet, but one thing jumped out right away when I looked at the ‘what is Azure’ page: the Python logo is in there. It should be no surprise for those following closely the evolution of IronPython and the amount of effort being put on Dynamic Languages at Microsoft. Now with Google App Engine and Microsoft Azure, Python will be playing an important role in the two biggest Cloud Computing platforms out there. Guido should be feeling really proud of this.